Back to Basics: How Does a Microstrip’s Length and Width Effect its Inductance? Ever wonder how wide to make the trace when routing from a DCAP to a via or pin? This paper shows that (for typical circuit boards) traces in the 10 – 20 mils (0.25 – 0.5mm) range have reached the point of diminishing return in lowering inductance: You’ll have to make the trace a great deal wider than this to even get an incremental improvement in inductance. This is the first in a series of “Back to Basics” signal integrity white papers. Contact me here if there is a particular topic you’d like to see addressed. The link for Understanding Signal Integrity's student problem set solution manual was accidentally deactivated for awhile, but it's now been restored. Click here to down load the PDF for the solution manual. Click here to read a brief description about the book (you'll need to scroll down an bit). The solution manual can be downloaded from there, too. It’s looking like the 2ed Edition to High-Speed Circuit Board Signal Integrity will be available by the end of May. I’ve just finished reviewing the first set of page proofs and will have a final review in March. Then it’s off to the presses! This edition is a complete revision of the 1st edition. It’s been totally reorganized, has about 30% more figures and text, and contains lots of new material (including new chapters about reflections and terminations). Here is the FAQ list for the upcoming 2ed edition of High-Speed Circuit Board Signal Integrity. Contact me here if you'd like to know more. A firm date hasn’t yet been set by the publisher, but it’s looking like it’ll be out during the first half of 2017. Yes, Chapter 7 is devoted to diff-pairs and serial singling, but this topic appears elsewhere in the book, too. The first edition was very focused on serial signaling and really didn’t discuss non-differential signaling very much. This edition plugs that hole and includes material on driving and terminating ground referenced point-to-point and multi-drop busses. Is the book practical or theoretical? It’s a mixture of both. It explains the theory in enough detail to understand the underlying physics, but it doesn’t get bogged down in the minutia. Math is kept to a minimum, but there are formulas you can use to calculate transmission line R,L,C parameters, delay, impedance and coupling. Practical advice is given throughout, and in some chapters lab results show actual waveform data. Does the book discuss power integrity? Yes, Chapter 8 coves the basics (including plane resonances), and Chapter 9 dcaps. But, the primary focus of this book is SI, not PI. Can this book be used to teach transmission lines to college undergrads? Yes, provided you want a practical perspective. Reflections and terminations are discussed in depth, as are losses and their effects. The math is held to a minimum in this book (there are no derivations - the explanations are intuitive rather than mathematical). Maxwell doesn’t show up anywhere, and there isn’t an integral to be found. Does the book have student exercise? No, it doesn’t. But, I’m considering developing a companion document that would have exercises and perhaps some laboratory demonstrations. Contact me here if you’re interested in learning more about this, or to send me suggestions. Will this book teach me how to run SI simulations? This book tells the reader how circuit board signaling works and identifies underlying pathologies (which are useful to know when running simulations), but it isn’t a simulation how-to guide. I create circuit board artwork. Is this book for me? It is if you want to understand the electrical differences between stripline and microstrip traces, and if you want to understand the kinds of things to watch out for when routing signals. You can also turn to it for advice on how to remedy crosstalk problems, how to route diff-pairs and where you should place terminators and dcap, and what to watch out for with vias. But, it’s not a layout design guide. And, the book assumes you understand the basics of resistance, capacitance and inductance. I’m estimating the book will have about 30% more pages than the first edition. But I won’t know for sure until we’re closer to the print date. Contact me here with further questions or if you want more information. Eric Bogatin is the editor, and the editorial advisory board is made up of several well-known industry experts. It’s published by Horizon House Publications (the parent organization of Artech House, the folks who publish my books) and is a sister journal to the respected Microwave Journal. 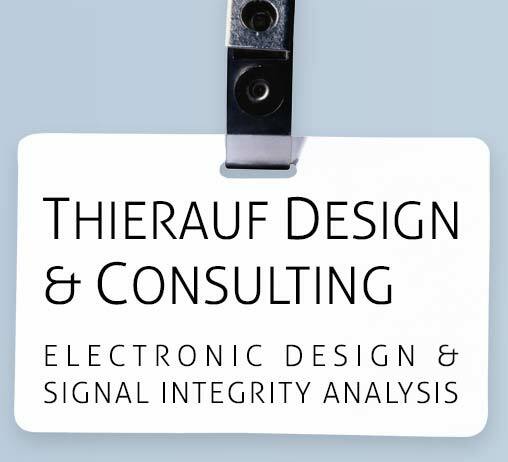 The Signal Integrity Journal covers signal integrity, power integrity, and EMI/EMC. A big plus is that the articles will be peer-reviewed. You’ll be getting serious content, rather than fluffy pseudo-articles pretending not to be ads. Use this link to get to the on-line journal: www.signalintegrityjournal.com. You can register from here https://www.signalintegrityjournal.com/user/new to receive email newsletters and other content. At the moment the journal is on-line only, but a print version is planned for 2017. Those visiting the Artech House booth at EDICON in Boston last week heard about the upcoming second edition of “High-Speed Circuit Board Signal Integrity”. The 1st edition has been very popular with signal integrity engineers, test engineers and chip I/O designers responsible for high-performance signaling. But, a lot has changed in the 12 years since it first came out, and an update is in order. While I was at it I decided to add new material so the book will also appeal to those engineers (and engineering students) needing to know about signal integrity, but who aren’t SI specialists. For instance, the 2ed edition has a new chapter covering reflections and terminations, and the original discussion on transmission line losses has been improved. The original capacitor chapter has a lot of new material, and the discussions on return paths, decoupling and power integrity have been rewritten and expanded. S-Parameters (including differential S-Prams) are introduced and discussed for the first time. Likewise, a new chapter discussing signal integrity pitfalls and layout techniques has been added. Some of this was scattered throughout the 1st edition but for the 2ed edition I’ve gathered it all into one chapter and added new material. The matrix math that appeared throughout the 1st edition has been condensed and moved to the S-Pram chapter. This makes it easy for the reader to skip that level of math if they wish. I’m guessing the book will be out sometime during the first half of 2017. I’ll post more once the publication schedule firms up. You can contact me here if you have questions or would like to know more. People have been asking how Figure C.7 in Understanding Signal Integrity: A Laboratory Manual was created. This graphic shows the difference between using the ground spring on the end of an oscilloscope probe verses using a 6” (15cm) long wire. You can see in Figure C.7 (on the right, reproduced from the text) that with the wire lead the probe doesn’t act as you’d expect from theory (which was shown in Figure C.6). Some frequencies are displayed by the oscilloscope with larger amplitudes than the actual measurement (the Y axis 100% mark), but others are displayed with less than what was actually present. Pulses (which are made from many harmonic frequencies) will be distorted, and their shape and the amount of ringing will change as the ground lead is repositioned or changed in length. So, how was the plot taken, and how can you measure the characteristics of your own probe? I used the tracking generator from my RF spectrum analyzer as a source because I know its output is flat across the frequency range I wanted to measure. You cans also use a sine wave generator provided you know its output is flat (the amplitude doesn’t change as you adjust the frequency). Because you want to determine the response when your probe is connected to your oscilloscope, the best way to make the measurement is to connect the probe to your oscilloscope and attach the probe tip and ground lead to the generator output. Don’t use the spectrum analyzer input because its frequency response isn’t the same as the frequency response of your oscilloscope. I set the tracking generator output amplitude to a convenient value and measured the amplitude on the scope when I changed the frequency in 10MHz increments from 1MHz to 300MHz. The results are displayed in Figure C.7. With this setup you can see how the frequency response changes as the ground wire is repositioned, or when you make it longer or shorter. How does temperature and bias voltage alter the capacitance of a MLCC capacitor?